‘Tis the season to give! I’m inviting my DC area readers to join me at a holiday fundraiser for the Black Benefactors, a philanthropic network that raises funds and provides grants for organizations serving African American children, youth and families in the DC region. I founded the Black Benefactors in an effort to give back to my hometown of Washington, D.C. and you can read more about it HERE. 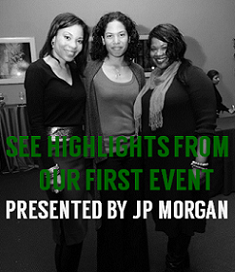 This event will not only help us to raise funds, but will be an awesome networking event to meet the movers and shakers in the DC nonprofit and philanthropic sector. Our fund is sponsored by the Black Philanthropic Alliance, a local membership organization for professionals working in or supporting philanthropy in the greater DC region. If you’re an organization that serves African American children, youth and families in the DC area, we need to know who you are - so please attend and bring brochures! There is no cost to attend, but we’re asking guests to purchase an entrée as a suggested donation, as we’ll receive a portion of the night’s food and drink sales. 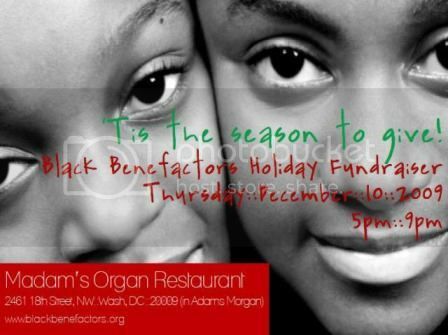 The event is being held at the Madam’s Organ Blues Bar and Soul Food restaurant in DC. And this is not just any restaurant. For the past 13 years, the owner of the restaurant, Bill Duggan, has taken DC youth to his homes on the Delaware shore to give them a break from the city life. His efforts were featured this year in the Washington Post article ‘Fighting the Tide of City Life,’ and it shares that kids stop by his bar before it opens for a Shirley Temple, some bringing their report cards. Read the article HERE and be sure to view the photo gallery! Thank you Mr. Duggan for your commitment and passion for DC’s youth! The atmosphere will be festive, with live music and door prizes! I hope to see you there! For more information, visit our website at http://www.blackbenefactors.org/. Can't attend but would like to make a donation? Please send an email to info@blackbenefactors.org. Corporate membership is now available and donations are needed for door prizes. 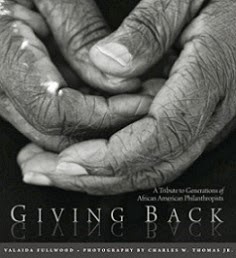 The Black Benefactors Fund is a donor advised fund administered by the Community Foundation for the National Capital Region (www.cfncr.org).